It’s bundt time y’all. That’s right. This is actually my #bundtbakers anniversary. My bundtiversary? No, I won’t do that to you. Anyway, this time exactly one year ago I had just joined the #bundtbakers and published my very first post as part of the group. The theme that month was “breakfast” and I whipped up a crazy amazing maple bacon bundt cake with an even crazier amazinger bacon pecan streusel swirl. Finding the bundt bakers was the beginning of something truly magical, and I like to think I’ve come up with some really special, really creative bundt cakes along the way. I’ve also watched the group grow and change over the months and I couldn’t be happier to have found such a special bunch of bundt lovers. This month our host, Laura of Baking in Pyjamas, chose Rocky Road as our theme. Can it get any better than that? 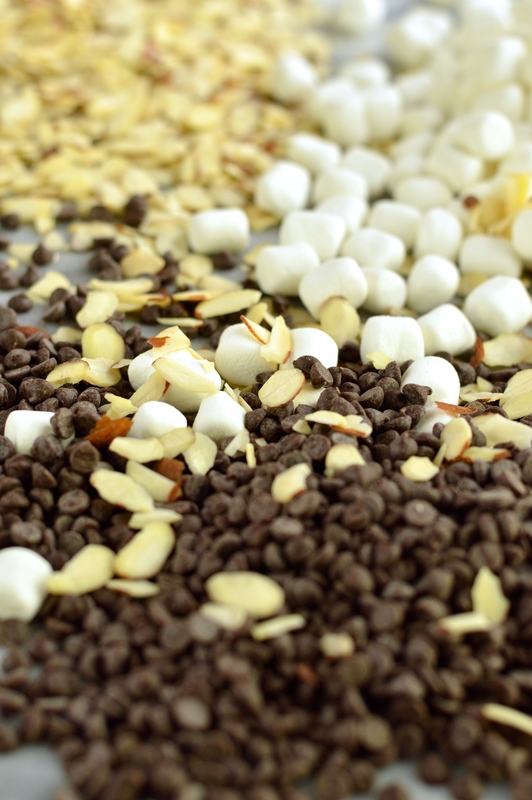 I mean, chocolate, nuts, marshmallows… What more could you want? I’ve never had anything called Rocky Road that contained either cookies or dried fruit. And what happened to the nuts? As it turns out, Rocky Road means different things in different countries. In Laura’s home country of England, Rocky Road traditionally includes the ingredients listed above. As you may or may not already know, American Rocky Road is usually an ice cream flavor containing chocolate, marshmallows, & nuts. In England, it’s a dessert usually eaten in small individual cupcake or brownie sized portions. After a little research I found out that Australia also has their own version that also contains coconut, glacé cherries, and turkish delight. After learning about all the different variations on Rocky Road, I asked Laura if it’d be okay if we expanded the theme to also include the American and Australian versions. After some significant consideration and much hemming and hawing over which variation to go with, I decided that the American version was the most familiar and sounded the most appealing to me. I came really close to trying to marry the English and American versions by adding cookies but skipping the dried fruit, but then I couldn’t decide what kind of cookie to use so I just scrapped the idea and decided to keep it simple and traditional. I find the creativity of the group and the wide range of flavors and variations on this theme incredibly inspiring, not to mention mouth watering. You really need to scroll down past the recipe and see what everyone came up with this month. Before you do though, you’ll probably want to grab a towel to wipe up all the drool. My original idea for this cake was to add miniature marshmallows to the batter and bake them right into the cake, but they didn’t cooperate. The marshmallows floated to the top of the batter and melted into a sticky mess when baked so I had to rework my recipe. I decided to put the marshmallows on top of the cake in the form of a glaze instead. In the end, this cake was a real winner. I brought it in to work and my coworkers haven’t stopped talking about it yet. 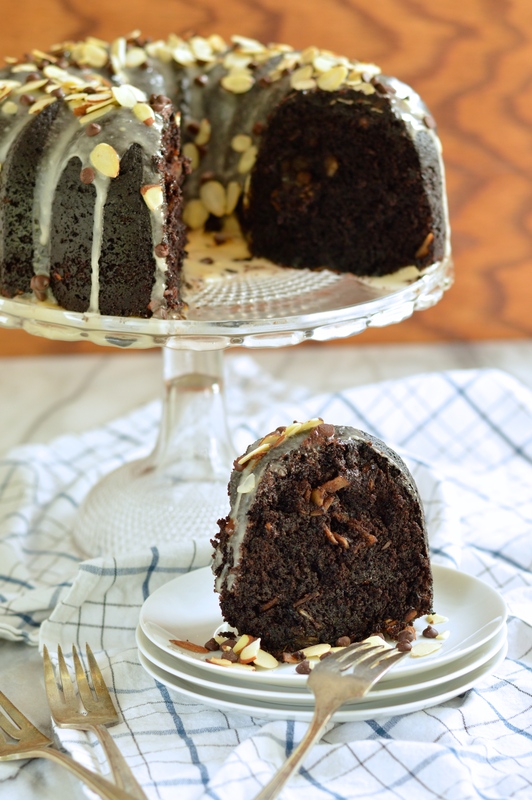 As if the super moist, super flavorful chocolate cake base for this bundt weren’t perfect enough, it gets a melty chocolate boost in the form of mini chocolate chips mixed into the batter. Thinly sliced toasted almonds and a touch of almond extract go in too, and take things to an even more amazing level of deliciousness. 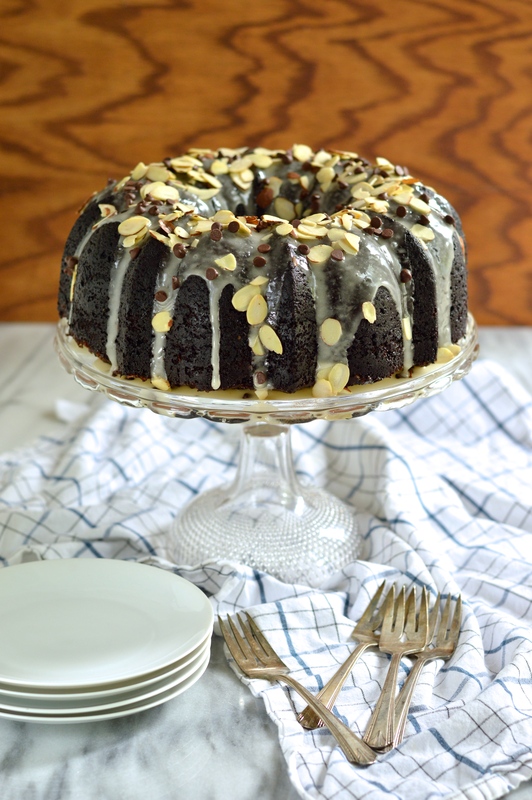 Just when you though it couldn’t get any better, a sweet gooey marshmallow glaze gets poured over the top and even more chocolate chips and almonds get sprinkled over that. Place an oven rack in the center of the oven and preheat to 350 degrees F.
Liberally butter a 10 to 12 cup Bundt pan and dust with a few tablespoons of cocoa powder to evenly coat the inside. Tap out excess cocoa and refrigerate pan until ready to use. Whisk water and cocoa powder in a small saucepan and bring to a boil over medium heat, whisking frequently. Remove from heat and let come to room temperature. Spread sliced almonds in an even layer on a small cookie sheet and toast at 350 for about 8 minutes or until they smell like nutty heaven on earth. Be careful that they don’t burn or they’ll become bitter. In the bowl of a stand mixer with a whisk attachment, mix together sugar, salt, baking soda, eggs and egg yolk on low for just one minute. Add the buttermilk, oil, vanilla extract, and almond extract and mix on low again for another minute. Add the flour and mix on medium speed for 2 minutes more. Add the cooled cocoa mixture and mix on medium speed for 3 minutes. The batter will seem quite loose and liquid. Reserve 2 tablespoons each of the sliced almonds and mini chocolate chips and set aside for the topping. Stir the rest into the cake batter until well distributed. Pour into the prepared cake pan and bake for 55-65, or until a cake tester or toothpick inserted in the cake comes out clean. Let the cake cool completely in the pan and then invert onto a cooling rack. To make the marshmallow glaze, mix sugar, vanilla, and salt in a bowl. Melt the butter along with 2 tablespoons of water in a nonstick sauce pan over medium-high heat. Remove from heat and immediately add in marshmallows and stir until completely melted, about 1–2 minutes. Whisk into sugar mixture until free of lumps. Pour glaze evenly over the top of the cooled bundt and sprinkle with your reserved toasted sliced almonds and mini chocolate chips. Cake should keep, well wrapped in an air tight container, for about 3 days. If refrigerating, let come to room temperature before serving. The bundt bakers really knocked it out of the park this month. Get ready to drool and check out all of these amazing bundts! #BundtBakers is a group of Bundt loving bakers who get together once a month to bake Bundts with a common ingredient or theme. We take turns hosting each month and choosing the theme/ingredient. You can see all our of lovely Bundts by following our Pinterest board right here. Links are also updated after each event on the BundtBaker home page here. Happy Bundtiversary! What a rich and dark chocolatey cake you baked for the occasion. Stunning as always. Love it… it looks great! Happy bundt-aversary! 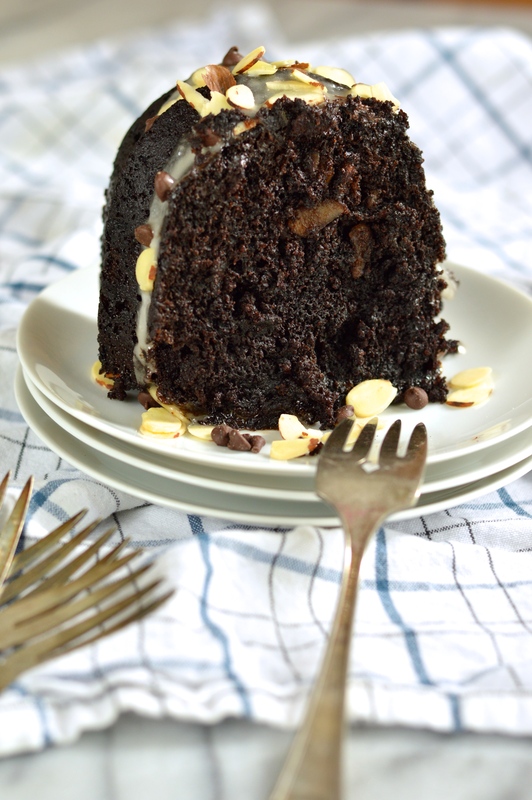 And this cake looks sinfully rich and delicious! Oh my you have out done yourself Tux this time! Now…get to polishing the silverware! Hee Hee. Have a safe and fun Holiday weekend! Thanks Cheryl! I’ve made it a mission to collect tarnished silver! :) I don’t really know why, but I love it! Oh really??? That is interesting of course only I would point that out to you! HA! I’m loving the deep dark chocolate. Gorgeous photo. Thank you so much Terri! Happy Bundtiversary!! 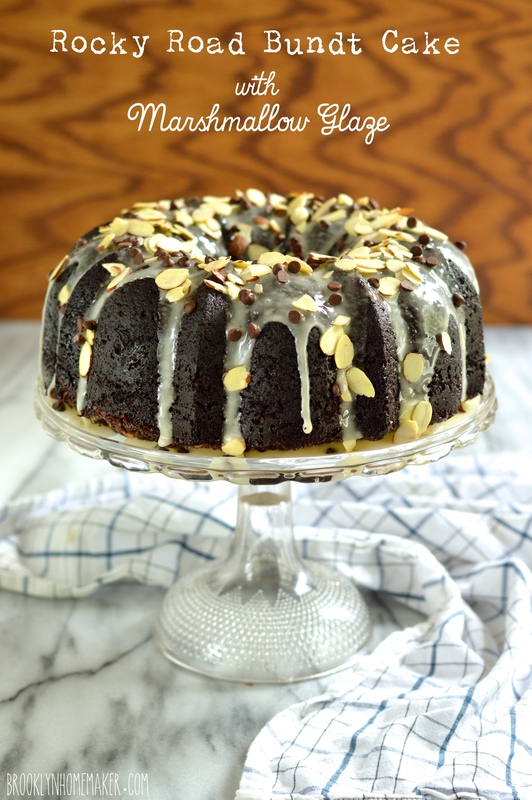 You made a gorgeous Bundt cake ! Love the dark chocolate! Thank you! I’m a huge chocolate fan so I really went for it! Happy Bundtiversary, Tux! I’m totally smitten with the cococa cake you’ve made. 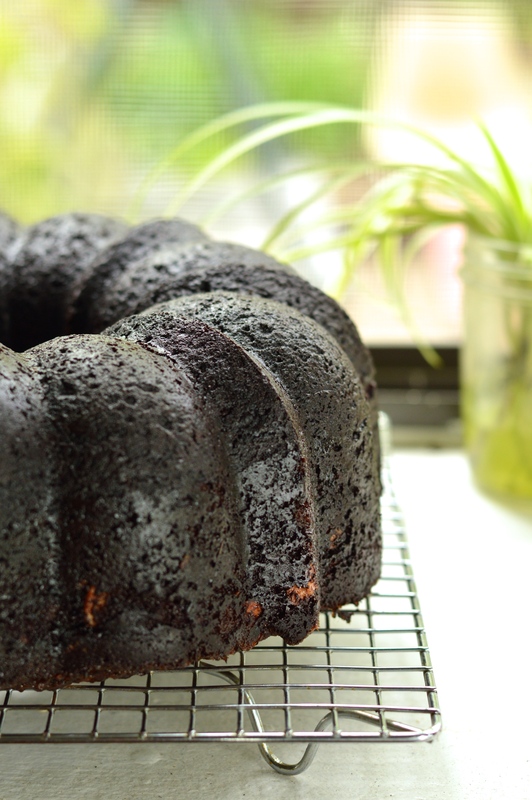 That dark, velvety chocolate is enough to make me want to dive right through the monitor and do a face plant onto your beautiful bundt! Thank you so much! I love dark chocolate so I use an extra dark cocoa powder called “double dutch” by King Arthur, and the mini chocolate chips makes it even fudgier and more chocolatey! Love it, love it, love it. What color is the chocolate and glaze wonderful .. It really gives such a nice flavor and perfect dark color! Nicely done, love the pouring of the glaze!! Thank you Tara! I love the way that gif came out! Thank goodness for a steady tri-pod! You. 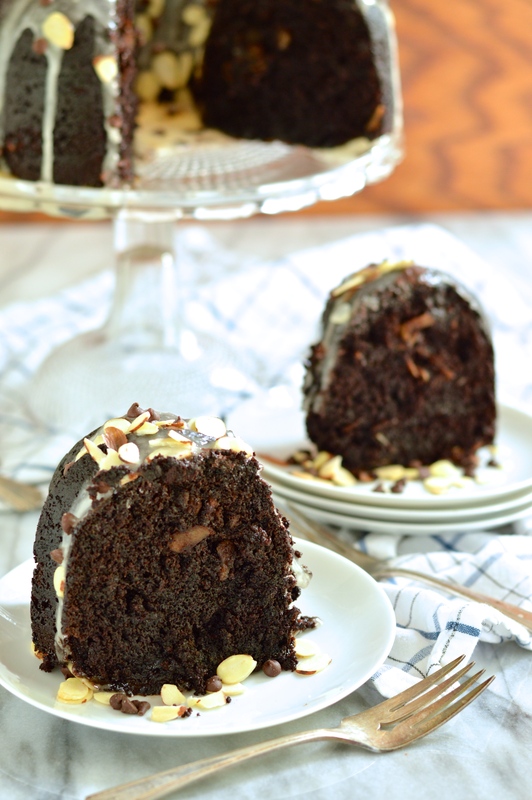 My dear, did a fantastic job on your Rocky Road bundt cake this month! Everything about it looks completely delicious!! Thank you so much!!! I was trying to get one perfect shot of the glaze going over the cake, but when I started editing the photos they all looked great so I put them together as a gif file! So fun! Happy #BundtBakers anniversary!! Tux, this cake looks killer. Insanity is right! The gif of that glaze… o.m.g. I am officially drooling. Your photos are amazing too, really stunning everything!! I am so glad you found us too, Tux! Your supportive contributions in the group always add to the discussions and help make it such a great community. And best of all, your Bundts are always inspired. I love the time and thought that clearly goes into each recipe, including this gorgeous sample. I’m with Olivia. I could watch that glaze pouring gif forever! It’s mesmerizing. Thank you! I didn’t realize you had just joined that month- so cool! Great looking Bundt Tux. Happy Bundtiversary. I decided to marry but included the dried fruits but not the cookies. 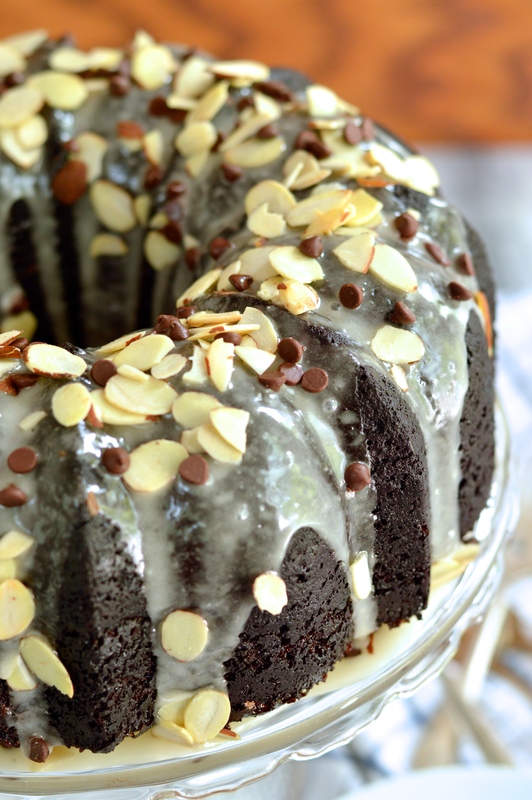 Gorgeous Bundt… Looks so delicious..
Omg, this looks AMAZING! I wish I could pull it off of my screen and devour the whole thing! I love the live-action shot of you adding the glaze to the top of the cake – how did you do that?! I went to a wedding in Denver this weekend and the bride and groom had a red velvet bundt cake as their wedding cake and then mini bundts for the guests! It was adorable. Thank you so much!!! To get the little video clip is kind of a process but I love the way it came out. I have very shaky hands so I use a tripod and remote shutter release for all my photography. I was trying to make sure I got 1 good shot of the glaze pouring so I took multiple shots and when I viewed them on the computer they all kind of lined up like that. There are websites you can visit to convert multiple photos into .gif files for free. So, basically you upload each photo individually, make sure they’re in order, and convert it into a .gif file. I really wish I’d thought of that bundt idea for my wedding. We did a traditional cake along with several pies. Which was still pretty great. bundts always feel so homey and comforting so I love making them. I definitely recommend a Nordic Ware bundt pan because they seem to be the most non-stick and highest quality. Thanks for stopping by! Now I need to get out my ice cream maker and start trying some of your recipes!! Moist chocolate. It just glistens with deliciousness. I clearly remember your first Bundt! I was filling in as host that month. As for Rocky Road, I really want to try the Australian version. There’s just so many things happening there. We always love all the bundts you make, we have a list with your bundts waiting to be made and this one goes right now to that list!!! Looks so delish with the chocolate!!! I love rhubarb, so I’m going to try your rhubarb bundt cake recipe. I also love making bundt cakes, so I’ll probably try more. . . .